In the photo above, the fan wearing the white shorts is a friend of mine named Brian (aka “puck collector” in the comments). The other fan wearing the red cap is his dad, Wayne (aka “father puck”). I didn’t know they’d be there, so it was a nice surprise to see them. Brian got off to a slow start during BP, but recovered nicely and finished with a total of four balls. As for me, my day got off to a blistering pace. …but his throw fell short and bounced off the plexiglass at the bottom of the steps. Guess what happened next? He went and got another ball, and he threw that one too short as well. I’m not sure if he was messing around with me or what, but he was acting like his arm hurt too much to reach me. (For the record, he is on the 15-day DL with “right shoulder weakness,” but come on, he couldn’t have been much more than 50 feet away.) Francisco Rodriguez, who was shagging in right field, saw what was happening and took over for Maine. He got a ball and FIRED it at me from about — oh, I don’t know — 150 to 200 feet away, and his aim was perfect. (Too bad he can’t pitch like that when it counts.) It felt great to catch it. I’d been trying for years to get one from him, especially in recent years after he set the single-season saves record, but he was always…how should I say this? Umm…rude. Chris Carter tossed me my third ball less than a minute later, and then I lunged awkwardly over the railing and grabbed a ground-rule double that unexpectedly bounced all the way up off the warning track. My seventh ball of the day was tossed by Hisanori Takahashi (yes, I asked him in Japanese), and my eighth was totally unexpected. Jose Reyes was in the cage, taking cuts from the right side and peppering line drives all over the field. At one point, I turned to watch one, and before I knew it, I heard everyone around me yelling, “HEADS UP!! !” I looked up just in time to see another ball flying 10 feet to my left and five feet over my head. And then — CRACK!!! — Reyes promptly hit another line drive somewhere. Could Reyes have hit a home run in such a quick time frame when I wasn’t looking? It seemed unlikely, and after I chased down the ball, I looked up and noticed that a coach was hitting fungos from shallow center field. I would bet that the ball was a fungo that sailed too far. The guys in front of me insisted it was a Reyes homer, but I didn’t trust their baseball knowledge. I caught the ball in the tip of my glove and got a thumbs-up from Takahashi. “Want to guess how many balls I’ve snagged?” I asked. He was rather surprised to hear the actual number, and he took it well. (He was supposed to have arrived at the start of BP, but got held up because of an unfavorable train schedule.) He ended up snagging two baseballs — a respectable total under any circumstances, and especially good for having missed such a big chunk of time at the start. He asked me why, so I told him about my deadlines and all the remaining chapters that I still need to write and then edit. I thought we were going to keep talking for a while, but all his teammates started pouring onto the field, so he had to go stretch with them. It was kind of frustrating because I knew he would’ve talked longer, but at least I got to see him. The Padres eventually began their portion of BP, and it was dead. The players shagging in left field were ignoring everyone (ahem…cough-cough…Mat Latos), so I headed over to right field. I thought I might have better luck there, and also, Heath was in right-center. I wasn’t planning to ask him for a ball. I just…I don’t know…wanted to stand closer to him because…why not? When I looked up, the only thing I saw was the overhang of the Pepsi Porch. (That’s the second deck.) Where was the ball? Was it a home run? Or was a player throwing one into the seats? The music was blasting, so we had a tough time hearing each other. In addition, Heath had to keep craning his neck to look up at me, so he told me to head over to the seats along the right field foul line. See the cap I’m wearing? Here’s a closer look at it. 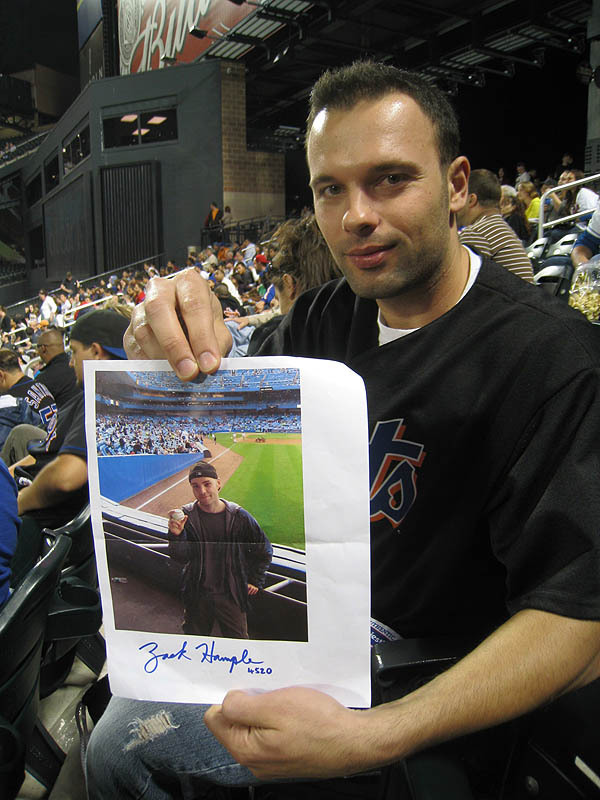 Heath gave it to me on 8/31/08 at PETCO Park. Heath and I talked for the rest of BP, and eventually, other fans got in on the conversation, too. One topic that came up was his recent bashing of the Mets organization. I hadn’t even heard about this. Another fan brought it up and was NOT happy about it. Heath was cool about it and defended himself well. He said that the newspaper pulled random quotes out of context and completely got the facts wrong, and that he’s so mad about it that he’ll never talk to any reporter from that paper again. He did, however, give a specific example of how badly the Mets treated him, and it was shocking. He said that when the Mets clinched the NL East in 2006, he was reprimanded and fined for “celebrating excessively” after the game. I asked him what exactly he had done that was deemed excessive. He said he was just spraying champagne in the clubhouse with David Wright and Jose Reyes and jumping around with everyone else and screaming and going nuts, but because he hadn’t been on the team all year — because he had spent more time in the minors than the majors — some people in the front office basically said he shouldn’t have been THAT excited…and that he was out of line…and that he didn’t really deserve to be such a big part of the celebration. These are not exact quotes. I’m just summing it up, but you get the idea. I was amazed and disgusted to hear that the Mets treated him like that. As Heath pointed out, he’d already been with the organization for many years at that point. He said he absolutely loved the Mets and rooted for them as much as anyone, even when he was in the minor leagues, so when he finally made it to the majors and the team clinched, he was as excited as anyone and just let loose. Can you blame him? All I can say is: shame on the Mets. Of course, there may be another side to the story, and if there’s anyone from the team’s 2006 front office who’s reading this, please get in touch and tell me the story from your point of view, and I’ll be happy to blog about it. (Maybe the Mets executives from 2006 are now running Best Buy. That would explain a lot.) Heath did say that he’d be happy to return to the Mets someday. He said he’s only upset about how he was treated by a small group of executives, most of whom are now gone. Everyone appreciated hearing Heath speak from the heart, and let me make one thing clear: the time he spent chatting it up along the foul line wasn’t all negative. On the contrary, there were lots of funny moments. For example, there was an annoying kid who kept begging for a ball and eventually told Heath that it was his first game. “It’s also my first game,” said the guy with a rough New York accent. It was hilarious. Everyone was cracking up and declaring that it was their first game, and as for the kid, Heath ended up signing an autograph for him, so all was right with the world. Heath signed for everyone. He was accommodating and funny and insightful and friendly. If you don’t root for him (at least when he’s not facing your favorite team of your fantasy players), then there has to be something wrong with you. Shortly before the game started, I snagged my 11th ball of the day behind the Padres’ dugout. Jerry Hairston tossed it to me after playing catch, and then I grabbed a seat in the eighth row. It was a good spot to snag a 3rd-out ball, but I had some competition. Brian and Ross were there, and they were both wearing Padres gear. We decided to take turns each inning rather than simultaneously charging down to the front row and creating a mini-stampede. Brian, we all agreed, would get the 1st, 4th, and 7th innings, I would get the 2nd, 5th, and 8th, and Ross would get the 3rd, 6th, and (if necessary) 9th. We were all sitting behind the outfield end of the dugout — the perfect spot to get a ball from the first baseman, but a terrible spot to get one from the catcher. I would’ve gone to the home plate end, but I’d just gotten the ball from Hairston over there, and I didn’t want to intrude on the people in that section. I told Ross that he should go there, but he didn’t, and whaddaya know? Ike Davis struck out to end the first inning, and Nick Hundley, the Padres catcher, tossed the ball into the crowd right where he would’ve been. One inning later, when Mike Pelfrey tapped softly back to the pitcher for the final out, I headed down to the front row and knew that I was going to get the ball. There was absolutely no doubt about it. The only question was whether Adrian Gonzalez would toss me the actual game-used ball or if he’d pull a switcheroo and give me the infield warm-up ball instead. Clearly, it was the infield warm-up ball; a gamer would never be that dirty and messy. Did I care? Not at all. I was just glad to have another ball. His mother had purchased tickets there, and while it pained me to sit in the middle of a row, I knew that there really wasn’t any other place I could’ve gone that would’ve been much better. Citi Field is a decent stadium for batting practice, but once the game starts, it’s terrible for ballhawking. I won’t get into all the reasons why. Just take my word for it. In case you can’t tell, that’s Heath on the left. Soon after I took that photo, he saw me and gave a subtle nod. The game was awesome. The Padres were winning, 1-0, with two outs in the bottom of the 7th inning. I was counting down the outs — four to go at that point — until Heath would get a save opportunity, but Jose Reyes spoiled it with a deep drive to left. The ball hit the very top of the wall and bounced back onto the field. At first, it was ruled “in play,” but then the umps reviewed it and overturned the call and awarded Reyes with a game-tying homer. Anyone want to guess what baseball I’m holding in the signed photo? Here’s a hint: you can find it in the photo section of my website. Also, FYI, the number under my name says “4520.” That was my current ball total at the time that I signed it. I’ve been signing all snag-related autographs like that since my first book came out in 1999. I never signed Watching Baseball Smarter with my ball total under my name, but I plan on going back to that signature when The Baseball comes out next year. I made it back to the dugout during the top of the 10th inning, and Ike Davis won it in the bottom of the 11th with an absolute BOMB to right field. According to Hit Tracker, the ball traveled 444 feet (and jumped off the bat at a speed of 113.7 miles per hour). Look where it went. Cool, no? Davis’s home run was a solo shot. Final score: Zack 12, Mets 2, Padres 1. My Ballhawk Winning Percentage is now .833 (12.5 wins, 2.5 losses). That’s good for first place in all six major league divisions. Next game for me? Who knows. I seriously have to get back to work on my book. • 162 balls in 15 games this season = 10.8 balls per game. very good entry my friend. It’s always nice when you get to meet players who are genuine good guys. I’m definitely a fan of Heath Bell and hope that he keeps pitching well. What a great guy! Nice job today, but get back to work! FYI — For those that click on that photo in may last comment and can’t tell what Heath’s about to kick, it’s his glove. Great stuff! For the record, I am not a ballhawk, just the father of one. In addition, although I am not looking up, I am well aware of baseballs heading my way–and that one was not a threat. Folks, the ball Zack caught leaning over the rail was very nice. While Brandon took great pics, no photo can capture it all and I thought Zack started pushing the envelope just a tad in leaning over a 20 foot wall to get that one. First of, let me tell you how much I love reading your blog. I played baseball at Guilford for three years before I ended up transferring so seeing a Guilford alum doing big things is always awesome. I’m in my fourth season of professional baseball and am now in independent baseball with a team in El Paso. I know you are pretty busy with collecting MLB balls but I figured maybe you’d like an American Association ball to add to your collection. Just let me know…keep up the good work! Zack, by any chance are you going to any of the Mets vs. Reds games next month at Citi Field? I’m a long time reader of this blog, I’ll be there, and it would be great to meet you. this was a great game even though the Padres lost. and btw way the picture is “antique light”, not sepia! Here is my ballhawking nightmare that I mentioned on twitter. Please spread the word. I want ESPN and the media to be aware that most ballhawks are fan friendly and give baseballs to young kids. Thanks. Glad you enjoyed it — and that you’re a Heath fan. Good to know that Heath is nice to people everywhere, though I’m not surprised. As for Mat Latos…hmm. He’s young. Maybe I caught him on a bad day. I’ll give him a chance to redeem himself. Hilarious! Thanks for sharing that. I figured you were aware of what was happening, but those pics are still pretty funny. Oh, and thanks for confirming that I did, in fact, make a nice catch. Twenty-foot wall? Eh, whatever. Thanks so much! You played for Coach Baker? Or was Nick Black coaching when you were at Guilford? I’ve lost track of what’s going on with the baseball program there. El Paso…wow. I can’t even imagine what it must be like living and playing there. I appreciate the offer to send me a ball, but I’m going to respectfully decline; I actually don’t have any interest in owning baseballs unless I personally snag them at major league games/stadiums. Does that make any sense? I hope so, and thanks again. Sorry to say this, but no, there’s almost no chance that I’ll be there. I’m going to have a lot of family in New York for an extended July 4th holiday, and we probably won’t even be in the city that week, and I also have to work on my book. But you never know. Anything can happen. And if it doesn’t happen next month, then hopefully we can work it out soon. That sounds rough. Congrats on getting one. 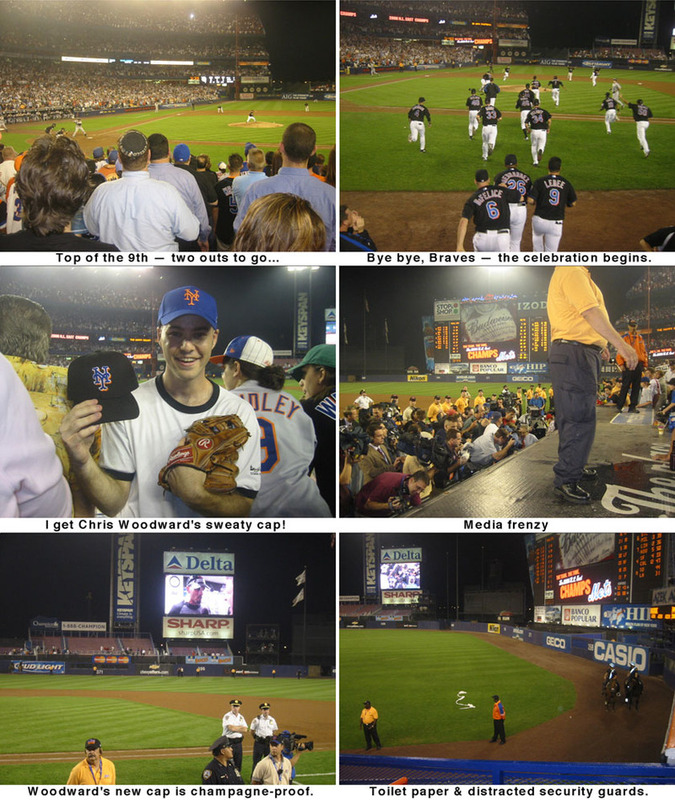 I don’t think I’ve seen any Shea/Yankee balls this year, but I’ve only been to Citi Field twice. Great game indeed. Sorry for getting the “sepia” thing wrong, but thanks for setting the record straight. Hey whats up zack? This is the first time im posting anything. I just want to say that you are a great guy with a great talent. I look up to you a lot. My collection is small but growing quickly and i wanted to ask if you are going to Coors field or Kauffman anytime soon. Thanks man. wow – that picture Brandon took with the seems is truly awesome. looks like you’re about to catch a knuckle ball. excellent hurdling pictures too. Before I saw your comment, I got a kick out of how he didn’t look up from the scorecard. Good stuff. Thanks so much. I really appreciate hearing that, and welcome to the comments section. I don’t think I’ll be at Coors or Kauffman this season because I’m so busy with the book, but if that changes, I’ll be sure to post about it on my blog. I’m glad it wasn’t a knuckler. Those things can be HARD to catch. 40 balls?! Maybe in one series.